Spring has been lovely this year and I have particularly loved walking around Melbourne’s inner suburbs of Northcote and Carlton. There have been so many beautiful moments when you see a blossom poking through a fence or in this case growing spontaneously in a small crevice. 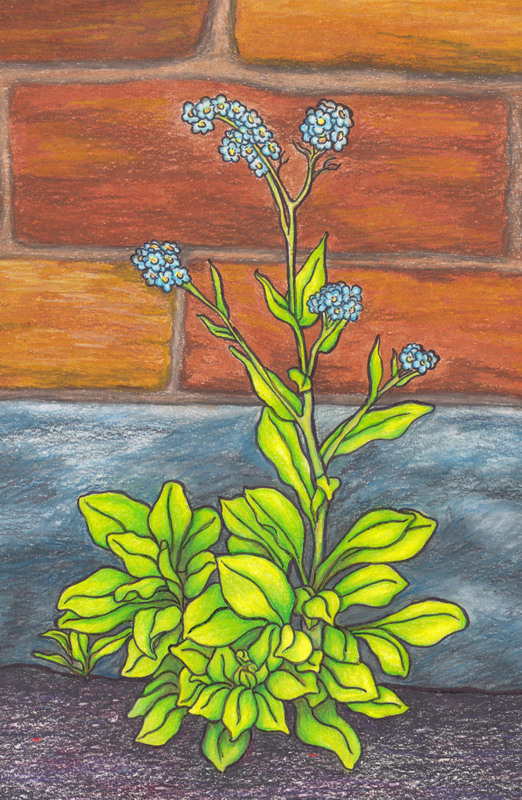 This lovely little forget-me-not I found on a walk at lunch time, it was growing in a crack at the base of a terrace house wall. Over the days we watched it grow and bloom. How it found any ground to put its roots into I don’t know but it grew and flowered so happily. These moments of beauty inspired me to start a series of this lovely, simple garden flowers that have made every walk I take such a joy. I used A3 bamboo paper for this painting and used only coloured pencil alone, no under painting this time. I tried to show some difference in the textures between the asphalt foot path, bluestone footings and the old handmade bricks.